Sport4Kids Football Coaching, Child Development & Girls Football Blog! We are passionate about everything to do with sport and child development. We have a number of authors who love nothing better than to post about their passions, thoughts and feelings around the sports that they love. Take a look at our posts below and remember to link in with your favourite authors via email and social media! In teaching toddlers and young children rugby, what can we learn from the two different codes of Rugby? Is one more preferable to follow for designing kids rugby skills, games and rugby classes? According to perceived wisdom, rugby league trumps union every time for ball movement, catching, passing, faster, more creative running lines, more pressure on handling and as a result in the art of handling ball skills outstrips Rugby Union. So should that would be a good start for designing kids rugby classes? Union on the other hand has more set piece technical skills than League and has more diverse sets of skills and power, strength and more variation meaning that Union has more strategic decision making, more tactical nuances and is for the thinking rugby player. Arguments will abound which is tougher and more skillful but which is more relevant to teaching kids the rugby basics? Let's look at the foundations and history of the rugby codes to see if we can find any clues? The 2015 Rugby League Challenge Cup Final between Leeds and Hull Kingston Rovers drew a crowd of some 90,000 fans plus a global TV audience of millions (league regularly attracts four times as many viewers as union). The, the match fell on Rugby League's 120th birthday, it being 120 years since the invention of the sport in the George Hotel, Huddersfield. Celebrations were decidedly muted in mainstream media with the Union code, was having a celebration of its own called the Rugby Union World Cup. 120 years ago the breakaway clubs were comprised of players who couldn't afford to take time off work to play rugby. They could only play if they received some compensation for missing time from their work and their earnings. These were called 'Broken time payments' outlawed by the Southern RFU establishment. To pay the new professional players the clubs had to create a more entertaining fast flowing game to get the spectators through the turnstiles. A new form of Rugby with 13 men reduced from 15 to give more space on the pitch, line-outs were banished, as were slow mauls and traditional rucks all replaced with fast "Play-The –Ball" re-starts. Even scrums were transformed into non contested re-starts for knock-ons and balls out of play. All designed to get the ball in hand, to pass the ball to the backs, to run with the ball and set up attacking plays at every opportunity. This is an important data point for understanding the different skills sets required in Rugby League compared to Union. The BBC has a great article where they ask four greats of each code to compare the differences and similarities between the two codes, the different challenges they present and skills they require, and the evolution of both games. "Breaking the code: how rugby league and rugby union compare" is a well worth a read for their experience and insights. http://www.bbc.co.uk/sport/rugby-union/25124313. For the purposes of looking at skills suitable for childrens rugby development however and for designing kids rugby classes, we need look at a more granular skill and techniques used in Rugby League and Rugby Union. How do they point to the skills that we teach our youngsters at early stages of their development? Which code has better at Passing and ball-handling? The Kangaroos (Australian Rugby League national team) are renowned for their superb passing and excellent lines of running, perhaps even better than the All Blacks. "The handling skills in league are higher generally. If you look at the top sides like Australia and New Zealand, if they create an overlap, the chances are they will score. They don't throw miss-passes for the sake of it and their short passing and angles of running are better." This is even recognised by the Union elite. "The passing skills in all positions in league are far superior to those in union. The best sides in League are very clinical - when the opportunity arises the skills allow for good accuracy and execution. Union could definitely learn from having those skill sets." So for ball handling which is key in the design of kids rugby classes then tips and lessons from league should be considered a key part of the recipe. League is more about constant movement whereas Union is about greater physical exertion in bursts with longer recovery matching the stop start explosive nature of set plays. Even injuries and substitutions are treated differently between League and Union. League allows the trainers on as the game progresses and rarely stops for substitutions and injuries. Jonathan Davies: "I enjoyed fitness and worked really hard at it, even as an amateur, and especially on my speed. While union is quicker at times, the ball is in play more in league, so it is less stop-and-start, and with the constant running up and back in defence I found my fitness levels were tested more." Tulsen Tollett : I found that my aerobic fitness decreased when moving to union after a season in league as I'd been up and back defending in league - you're almost doing shuttle runs all the time." Continuity is a big lesson for getting more kids with ball in hand and on the move. This would be critical to designing kids rugby classes. Rugby League's constant movement and keeping kids involved is also important for keeping the fun factor up in kids rugby classes. Although health and fitness is important fun is the perhaps the most important factor and keeping kids on the move throughout a rugby class, keeping them all involved and interested, using the continuity of league fast re-starts and no set plays should be the over-arching principle. Rugby League fast re-starts means that more time is spent by players with the ball in hand running at well organised defences trying to find small gaps and lapses in defence. Jeremy Gusgott shared "When Henry Paul and Jason Robinson [former Wigan rugby league players turned England union internationals] pitched up at Bath many years ago, their broken-field running and attacking was like nothing I'd ever seen before in union." The All Blacks teach kids in the "Small Blacks" program to run with the ball with two hands in front of them. This is to both maximise the opportunity of a pass should the situation arise, but also to confuse the defence as they find it less easy to know which way you are running and whether you are going to pass or run past them into space. Because in Rugby League there are more opportunities to run the ball, more situations where you encounter the passing skills. It means that League players become more aware of their opposition numbers, positions and defensive shapes as they encounter them more. Their peripheral vision and recognition of shapes and formations are stronger. How often when we are down at the pub watching an internationals and the wide camera can see an obvious overlap and a top international Union player takes the wrong option. This very rarely happens in League. Defences in league are always in better shape and when there is an overlap the attacking team are often ruthless and complete the move with a try. Consequently there are more tries in League and the attacking and backs play is more precise and consistent. So recognising overlaps, choosing the right pass, run or missed pass should be a key principle in developing young rugby players and designing kids rugby classes. Tries and attacking plays often come from small details and small advantages in open play in both codes. In League with the ball in play and in hand for a high percentage of the game players get to practice supporting each other more often. They get to practice their running lines, how to position their support running and how and where to support your player depending on the shape and positon of the defence. The technique of support running "On the Shoulder" is a valued skill. These techniques are honed day in and day out in League and theses skills with a more open, continuity based set of rules for Union mean that these type of skills are being brought into mainstream union coaching. Offloads and shoulder running are seen historically in League and are one of the key stats that are reviewed at half time and at the end of the game in analysing why teams have won. It is increasingly being taken up, copied and honed by the Antipodean Unions and showcased in the 2015 World Cup where all the semi-finalist came from the Southern Hemisphere demonstrating great shoulder running and offloads in the tackle area. All of the TV pundits are talking about this trend. League also looks to get breaks at the ruck and the re-starts and to make breaks through the middle of the pitch with sharp passing, sharp running angles taking the ball at pace to break the line and gain yards. In Union when the back get the ball the intent is to move the ball wide into open space and often try to keep the ball moving and not be too focused on hitting opposition traffic. Decoy running and missed passes is also something that comes from the intense running formations and are routinely practiced in League. Decoy runners and missed passes that are pre-staged are increasingly seen in top international Union games. This is normally set up after 1 to 3 phases of play from a set piece, where a call can be made and organised. As the phases progress in Union it becomes more difficult to set up for pre-practiced formations involving decoy runners. In league the re-start is only one tackle away and so there are a lot more opportunities for pre-organised plays and therefore there is greater reward for training and practicing these techniques. Many of the attacking and defensive tactics and skills have been taken from League as best practice and implemented in Union international and top club sides. Some of the top defensive coaches in Union have started their rugby journey in Union. Jeremy Gusgott: "The defensive lines are similar because union has made big strides in following league's lead in this area. Union never really worked on defence as intensely as league did in the amateur era but that has all changed." Tulsen Tollett (former NRL and Super League rugby league star, and Premiership rugby union player): "There is one intricacy that is harder to master for a back in union - the sliding defence moves up and out at a quicker speed than in league because there is less space between yourself and the attacker in the 15-man code. This is an area that can cause a few problems when it comes to transferring defensive skills. It is evident that we need to look at both codes for defensive routines as part of designing kids rugby classes. Well longer kicking is definitely better in Union. With three points for a long range effort and the reward for a miss being a drop out back or a line out Union sides are used to taking the risk and practicing long range efforts more. In League they tend to keep the ball in hand and will kick a penalty to touch rather than risk giving the possession away if the long kick is risky. This becomes a self-fulfilling situation. More Union players practice the long distance kicks which need more power and accuracy. You can actually win a game of Rugby Union by concentrating on the kicking. Tulsen Tollett "The points system in union is a shame in a way as a team may score two or three tries to nil but still lose through having five or six penalty goals kicked against them. " Union also kick for distance as a defensive position from inside of their own 25 metres line. League will keep the ball in hand and go through a series of tackles to move the ball down field and away from their goal line before kicking for territory on the last tackle. Jamie Peacock, (26 caps for Great Britain and 21 for England in league, and captained both) "Union's kicking game is exceptional and a vital part of that game. League can learn from that, especially the distance kicking and, given how important it is when you get three points for a penalty, the place kicking. Jonathan Davies "I would say the standard of goal-kicking is far higher in union than league. The percentages are higher in league, but if you don't think you can kick it, you tend to go for touch, whereas in union you will have a go at it. It is a different mindset. The kicking skills are certainly higher in union because they are utilised more. In league they keep more ball in hand. So where we look to teach kids kicking of the rugby ball then? Union would be the game to look at for tips. Johnny Wilkinson and his trademark preparation comes to mind and teaching kids the right way to prepare and execute longer kicks should come from watching union. Near an opponent's goal line League half backs will use delicate kicks in between tacklers and behind the back line to break down defences. Well timed kicks into the dead ball area looking for try scoring or drop outs from behind the goal to regain pressure are a key tactic in League games. Jeremy Gusgott "Both codes use kicking as a way of gaining territory by kicking deep. Union has more contested kicks, where two or more players jump for the ball, whereas league would probably only kick to contest possession within 25 yards of the opposition try line." League will only do "Up and Unders" at the last tackle and near the oppositions line and will also use the grubber kick more often and in tighter situations. The delicate use of the short grubber or pass kick for wingers to get on the end of men's that short range kicking skills in League are more practiced and more skilful and require a more delicate touch. Tackling is an interesting subject. In League they aim to have the initial tqckler stop the charging player in their tracks to reduce the ground made whilst at the same time try to smoother the player to reduce the chance of offloads. They also use the tackle area t try to dislodged the ball and create a handover from a knock on. In union there are other things to consider like turning your opponent to your side to try and get a turnover from not releasing. Tulsen Tollett "In union, body position becomes important, not just carrying the ball but also defending, as you are trying to really stop the play dead and either hold the player up to force a put-in for yourself at the scrum, or be quick enough to make a tackle and effect a turnover. That means that trying to not be on the ground in an offside position after making a tackle is key." For childrens rugby tackling isn't allowed till the age of nine years. However it does beg the question of how to prepare the right technical and physical attributes from 5 to 8 so that they are ready for the impact of full on tackling. It cannot be right that a child at the age of 8 years and 364 days has no exposure and overnight they wake up and they are ready for that type of high physical impact. This is a key consideration in preparing children in the design of kids rugby classes. Leaving most obvious difference between the codes to last. Rugby Union has more contested set pieces. The line outs, the scrums, the rucks, mauls and even the 25 metres drop outs are far more part of and a contested part of Rugby Union. In league they are designed to merely restate the game and favour one side and are not contested. The technical skills in scrummaging can be a whole science and dark arts in itself – a game within a game! Tactics and tricks and sheers power and strength applied in spit seconds can make a huge difference to the result of the game. Tulsen Tollett (former NRL and Super League rugby league star, and Premiership rugby union player) recognises this "Fewer league forwards tend to switch because league is a simpler game to play: there are no line-outs, rucks, mauls and so on, and the technicalities at these areas are something that take time and understanding to master." Adopting or designing complex set piece and re-starts would not be right for childrens rugby. Greater technical capabilities and size and strength as well as the time taken to organise set plays precludes set pieces from the design of kids rugby classes. Jonathan Davies having enjoyed great success in both codes is an interesting case. He was slight nimble and full of skills. He revelled in the space he found in league. His view is an interesting insight with respect to teaching and developing young rugby players of either code. "I really enjoyed playing both games, but once I had played league it was better for me because it suited my game. Playing union for Wales in those days against the top sides like England, France, Australia and New Zealand, we would often get dominated up front, so as a fly-half I could be starved of possession. In league I was getting more ball and there are four fewer men on the field so there is more space, and that suited me. " So for younger junior players avoiding the set plays and keeping the game moving suits smaller sized individuals. Both codes provide great insights on the skills we need to design into kids rugby classes. Just watching both codes and analysing each has ben fruitful in gaining insights on childrens rugby development. As one who played Union at school for several years and was brought up near rugby League heartlands and being an avid Wigan fan, I have a love for both codes. Nothing beats the excitement and passion of a Union International and that goes off the scale for a Lions game. Having spent time developing the Sport4kids Rugby program I will be avidly watching the intricate skills in both codes and seeing two the skills transfer both between codes but also how they translate into our childrens rugby development classes. 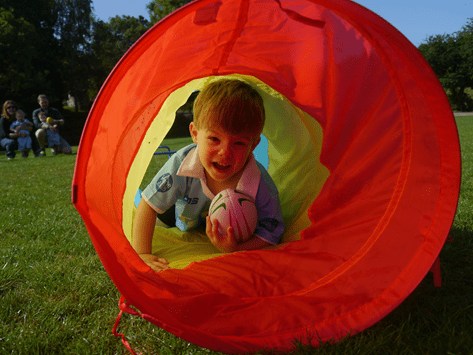 10 Tips for the Perfect Children's Sports Party! 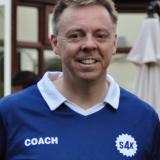 Steve is a passionate innovator in children's learning, parental advice in sport and a co-founder of Sport4Kids. He has vast experience playing and coaching across a number of sports, is married to Olga and is a father to a son DR (6 years old) and daughter JJ (5 years old). Being a passionate Everton supporter he is a follower of the "School of Science" and the coaching methods of Roberto Martinez. His boy hood heroes were Alan Ball famous for running himself daft in the 1966 World Cup Final and Muhammad Ali "the greatest" boxer of all time. 05 April 2016 How do the All Blacks Do It? 01 April 2016 Was Cruyff An Inspiration For Childrens Football?